Place filter under cold running water for 1-2 minutes and shake lightly to remove carbon dust. Prepare the flow control cap by removing the plug from the air vent hole and place it on the resting post. 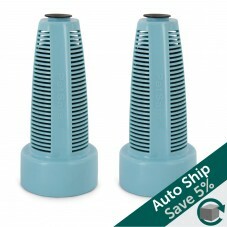 Gently push the filter onto the flow-control cap and tighten the cap. How do I fill the reservoir with water? Flip the reservoir upside down. Make sure the black lid is secure. The lid can be removed to check the water level but shouldn't be used to refill the water. Slide the base on the reservoir. It's sometimes easier if you flip the base upside down first. 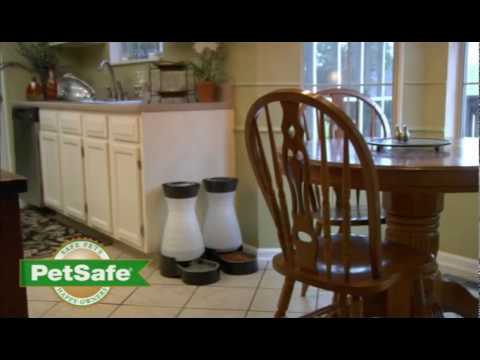 A brief overview of the PetSafe Healthy Pet Station gravity automatic feeder and waterer. Healthy Pet Food and Water Stations are BPA-free and feature removable, dishwasher-safe stainless steel bowls and wide reservoir openings for easy cleaning. Your pet will appreciate fresh, free-flowing food and water when you're away! Check to see if the cap is screwed on unevenly. Make sure the gasket fits properly. If you're not using a water filter, the plug must be attached into the air vent hole on the cap. Align the arrow on the lid to the unlock symbol on the reservoir. Turn either clockwise or counter clockwise to lock. Align the unlock symbol to the front of the water base. Turn the reservoir clockwise until it locks in place. Turn it counter clockwise to unlock it from the base.